Halloween “Fill The Truck” Pawty benefiting Humane Ohio is almost here! Join us and PetPeople on Saturday, October 21st for Rescue Me Ohio’s state-wide pet food drive! You can donate dog and cat food at PetPeople (3504 Secor Rd.) from 11am-5pm. There will also be games, contests and spooky fun! Cups for Pups & Tabbies, too – A Tea Party Benefit! Sunday, October 22nd at 8216 Erie St., the Sweet Shalom Tea Room An afternoon of tea, scones, delicious sweets and savories, music, raffle, door prizes, and fun! Join us September 9th for Tails on the Trails! Registration is now open for Humane Ohio’s first ever Tails on the Trails Walk and 5K! Check out our 2016 Annual Report! You can get your female cat fixed this February or March for only $20! Call today to schedule an appointment and be sure to mention Beat the Heat! 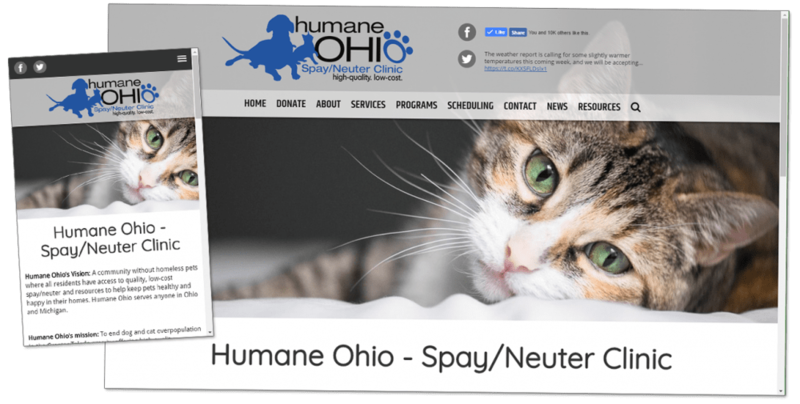 Welcome to the new and improved humaneohio.org! We hope the new format will make it even easier to find the information you need. We will be continuing to evaluate and update content, so please check back often.